Oh man this lasagna is amazing! What makes it green? Pesto and zucchini: very green! To make a lasagna you should first prepare all the ingredients for the layers. Then you will start layering them and finally comes the baking. Even though lasagna is always fantastic it tastes even better the next day, so make more than you need ;) Or prepare it one day in advance if you make it for guests! Actually this works great when you have a party, no need to prepare it at the last minute! This is the recipe. It is for 4 portions, baked on a square 8×8 inch (20×20 cm) oven proof pan. First prepare the besciamella as described in details in the Besciamella Sauce post. Then add the pesto to the besciamella, mix well and set aside. Slice thinly (1/10 inch – 3 mm) the zucchini lengthwise. Brush them with some olive oil and grill them on both sides. 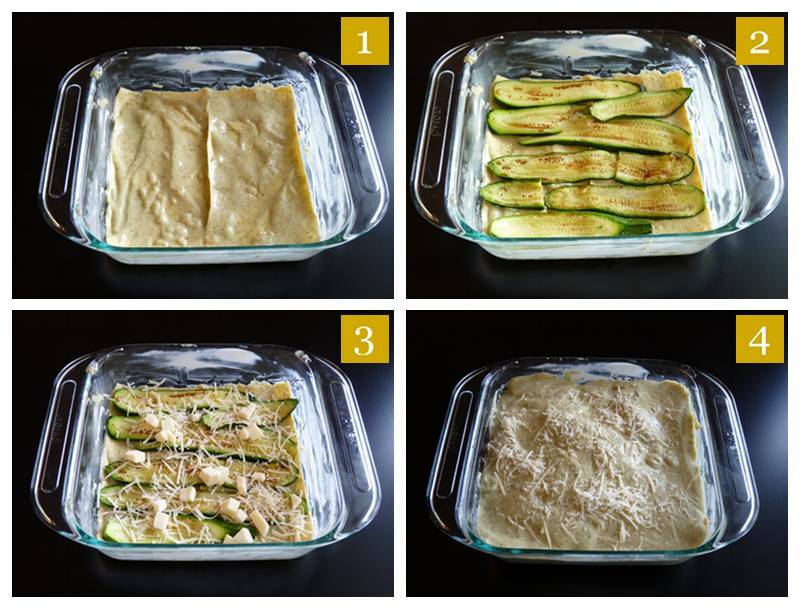 Turn the zucchini once when they are slightly brown on the bottom. You can use a grill or a pan on the stove works just fine. Remove from the pan, sprinkle with salt and set aside. You can see the zucchini in picture 2. Cut the mozzarella in small cubes and set aside. 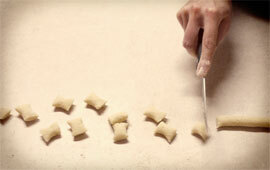 The last step is to prepare the sheets of pasta. I suggest using the Barilla Lasagne pasta. These are flat sheets of egg pasta. Note that I said two very important words: flat and egg. I have never seen a lasagna made with those white curly sheets of pasta before coming to the US. The Barilla Lasagne is exactly what we use in Italy, unless you are making the pasta from scratch. They come in a small rectangular blue box, you can find them in the pasta isle in every supermarket. Even though the box says “no boiling required” I like to boil the pasta just a little, so: bring to a gentle boil a pot of water with 1 tbs of oil (this prevents the pasta from sticking). Add 1 or 2 sheets of pasta at a time. Remove them as soon as they bend a little. You don’t want them cooked thorough but you want to make them a little tender, a couple of minutes are enough. I use a skimmer to remove the sheets from the water, then I lay them flat, ready to be used. Do not overlap them! You are now ready to layer your lasagna and bake it! Turn on the oven at 360°F (180°C). Grease a oven proof pan with the butter. Sprinkle a little besciamella and start the first layer with 2 sheets of pasta covered by 1/4 of the besciamella sauce (picture 1). Cover with a layer of zucchini using 1/3 of the zucchini you grilled (picture 2). Add 1/3 of the mozzarella cheese and 1/4 of the parmesan cheese (picture 3) to complete the first layer. 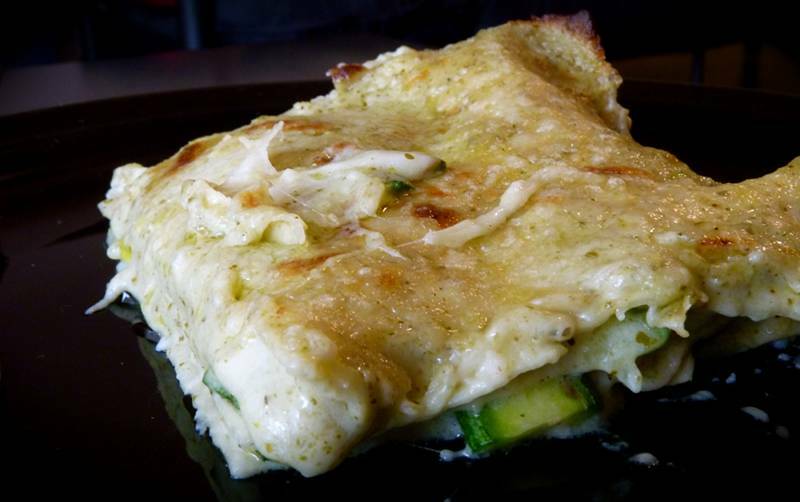 Continue with: lasagne – besciamella – zucchini – mozzarella and parmesan. And again: lasagne – besciamella – zucchini – mozzarella and parmesan. Finally cover with the lasagne, add the remaining besciamella and sprinkle the remaining parmesan (picture 4). Bake for 30 minutes. Broil for 5 minutes to get a crunchy upper layer (see picture below). Also, lasagna can be frozen before baking it, when you are ready to eat it just bake it for 45 minutes instead of 30. 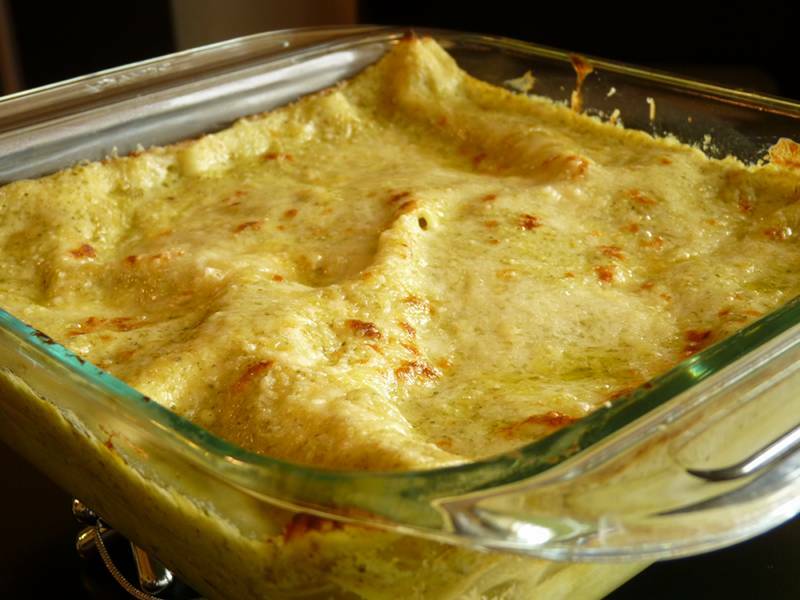 You can also freeze leftover baked lasagna, in this case the best way to reheat it is to toss it in the microwave.